Beautiful pillow but the color was a bit too dark for my room so I returned it. Add a colorful piece to your decor with this Pleated Square Decorative Pillow. You will have the option to choose from a variety of different colors to make sure that it matches your desired style. The hidden zipper makes for a clean look and the pleated will be something that you can enjoy for a long time. This item is made to order and no two are alike. I like these pillows however I am sending back the caviar and teal pillows because the teal is more of a greenish teal than a blue teal and doesn't match with my living room. Also the caviar is just black and I thought it was dark gray. I want to keep the slate gray one but I am wondering if I should since I won't have any other pillows to match the style. Maybe I will go with many different types of pillows on my couch instead of the same one in different colors?! more plush and beautiful than expected! It looked kind of dinky in the picture, but actually is a full, plush pillow. The Venetian red is a very nice medium red. It is a slightly cooler tone than looked on screen (to me on screen it looked like it had orange undertones but thankfully in person that is not the case.) The pleating adds a nice touch. The quality seems excellent but as I just purchased today I cannot comment on quality over time. Style to last a lifetime! These pillows are beautiful and functional! They are very large in size and the covers can be removed and washed to restore its beauty! I do recommend these for kid friendly homes as well as style seekers however the price could be a little more budget friendly! I was really surprised that this pillow would be as well made as it was. I ordered the purple, more of a plum, which is exactly what I wanted. The quality of the material is very expensive looking and the pleats really add to it. It even has a hidden zipper so that you can wash the cover. I would definitely buy more in another color, and probably will!! These pillows are more beautiful than I had expected. The different sizes of the pleating makes the one color appear to have more than one color. Just brilliant and beautifully crafted. I have ordered from Overstock a number of rugs for this area of my home and these pillows not only compliment the rugs they literally make the rugs stand out more creating an appealing and striking combination. They are beautifully crafted and I recommend them without hesitation. These are large pillows, so know that when you buy them. Most pillows are 18 or 20 inches (these are 22) so I'm not used to the size of them but will get used to it eventually. I ordered the teal blue color and the color is exactly as pictured so no surprise there which is good. My pillows are under stuffed a bit but not something I can't live with, just a little disappointing because I like nice, full pillows, not ones that meet the minimum. Overall, these are decent pillows but I'm not in love with them. I'm keeping them because they are the color I was trying to match and for that they are perfect. I purchased the safari tan color. These are really well made pillows with the hidden zipper if you need to clean the covers. Would recommend highly. Great purchase and received in a timely manner. Accents my home decor nicely. I really enjoy shopping at Overstock for my home decor needs. This is a beautiful pillow! The pleats make it rich looking. The color is vibrant and the fabric is lovely. I'm very, very pleased and recommend it to anyone who wants to enrich their environment. I like the teal color saturation of these pillows! I’m very happy with the sheen and pleating of these larger pillows, as they ground the smaller pillows. The rich teal color is appropriate for all seasons! They work with my winter accessories as well as spring, summer, and autumn accessories. Their size and color make them very useful as the changes in additional colors allow them to appear new with each season’s decor! i love these pillows! they are beautiful...great color, great fabric and well constructed! a bargain! Color was exactly what I was expectng and wanted. Should be easy care too. The pillows were plush but the material was really rough and the back was not smooth which made them look worn out and old. I returned them and was even more annoyed at having to pay for the return! nice colors, washable and nicely made. Love the colors. Look just as they did in the photos. I purchased Teal, Purple, and Silver. The design is beautiful. So happy! These pillows are pretty. Not the highest quality but the price reflects it. Good for a bed or somewhere not being used regularly or they will go flat. Too big and shiny for my sofa. They look really nice on my bed. A little larger than anticipated. This pillow is a must buy you will not regret. It is true to color great quality as far as the structure and martial. 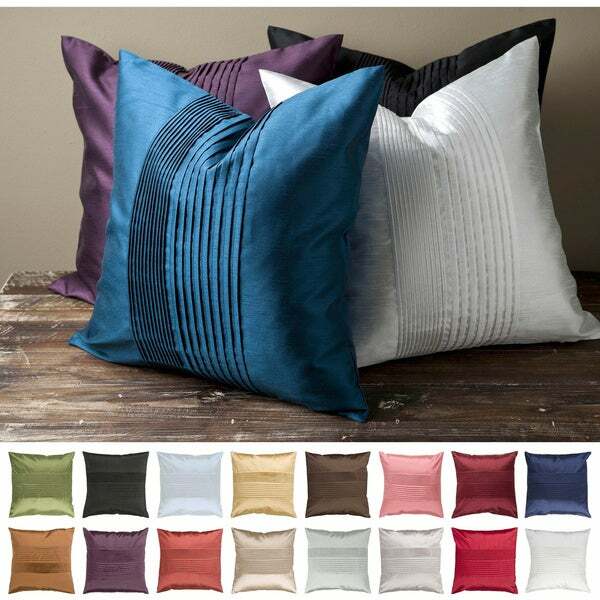 I replaced existing pillows in my living room with two of these and let me just say what difference it bring so much color without over doing it. "Is this a feather pillow?" No. It is a polyester fiber fill. "Is the "peanut butter" color option out of stock? Does not show up as a selection? If so, is s it due back in? Many thanks." Unfortunately, we no longer carry the peanut butter color option. The closest color we have in stock would be khaki. "I'm looking for a deep cherry red pillow. Is the venetian red more orange than deep red?" It does not have an orange hue. Nice shade of red but not certain I described as a "deep" red. "when will you have two light coral color? Thanks." "Will you be getting in more cloud blue? ***"
We are currently in stock with the "cloud blue". "I ORDERED 2 OF THE 18 INCH SQ.HIND PILLOWS IN BURGANDY,BUT CANNOT FIND MY ORDER OR SHIPPING INFO.CAN YOU PLEASE CHECK AND FIND OUT WHEN THEY WILL BE DELIVERED.............................THANK YOU......MY EMAIL ADDRESS IS "
Please call customer care for account information U.S. and Canada Toll free: 1-800-The-BIG-O (1-800-843-2446). I needed new accent pillows for my couch. I hope the color is what I expect it to be. These pillows will be replacing the brown animal print ones that came with my sofa.